Fisher, Louis; Harriger, Katy J. 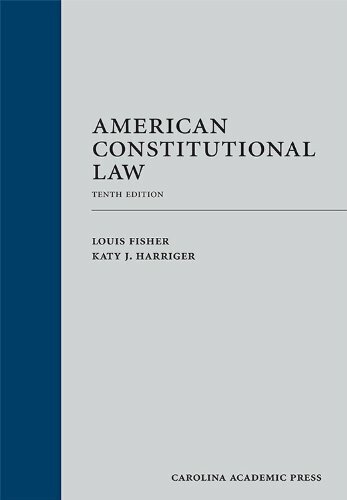 Now in its tenth edition, <i>American Constitutional Law</i> is the only book that develops constitutional law in the comprehensive sense. Along with containing analyses and excerpts of court decisions, the book highlights the efforts of legislatures, executives, the states, and the general public to participate in an ongoing political dialogue rather than passively receive a series of unilateral judicial commands. It covers all new developments in case law, congressional statutes, presidential policies, and initiatives undertaken by states under their own constitutions. The book includes readings not only from cases but congressional floor debates, committee reports, committee hearings, presidential vetoes and other statements, state actions, Federalist papers, and professional journals. It also includes a chapter on equal protection that addresses immigration law and the rights of aliens. Louis Fisher is Scholar in Residence at the Constitution Project. Previously, he worked for four decades at the Library of Congress as Senior Specialist in Separation of Powers (Congressional Research Service, from 1970 to 1996) and Specialist in Constitutional Law (Law Library, from 2006 to 2010). Katy Harriger is a Professor and Chair of the Department of Political Science at Wake Forest University.